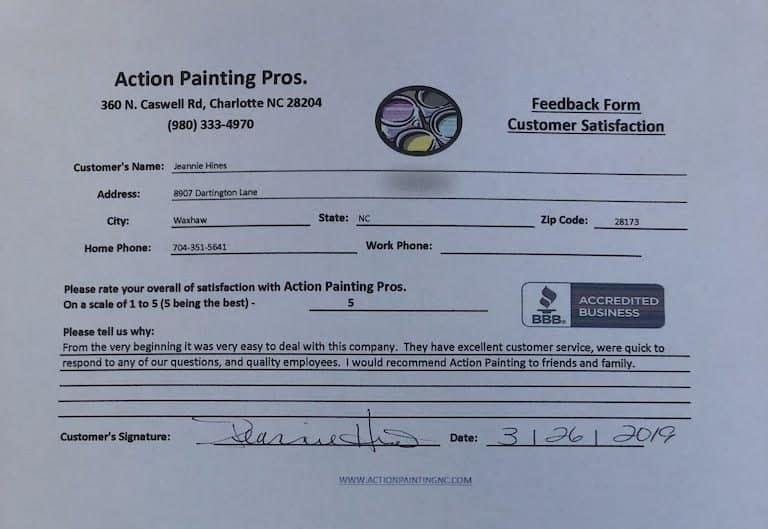 Thank you Action Painting Pros!!! Your team was timely, professional and clean! You painted my dining room, living room, a bedroom and bathroom. My house now feels like a home. The job was quick and looks amazing! Your 10% discount didn’t hurt either! I have and will continue to recommend your team to all of my family and friends! My wife and I wanted to let you know how pleased we are with the painting that the crew did for us. They did a fantastic job and the dining room and our bedroom look great. We are so pleased. Please let the crew know how much we appreciated the work they did for us. We will be back with you to do our bathroom. Not sure when we will do it, but will let you know as soon as we decide. Again, thanks for the super job that was done. My husband and I hired Action Painting Pro’s to paint our nursery for us and we could not be happier! Overall they were extremely professional, responsive and did a really great job. They were knowledgeable and provided great informative recommendations on what type of paint to use. We really appreciated their flexibility to accommodate our work schedules when setting up the job. We were also impressed by how quickly they were able to complete the nursery and the overall quality of the work. We would definitely use them again! Jennifer and crew are excellent! They always show up on time, do a very thorough job painting, and charge very reasonable prices. 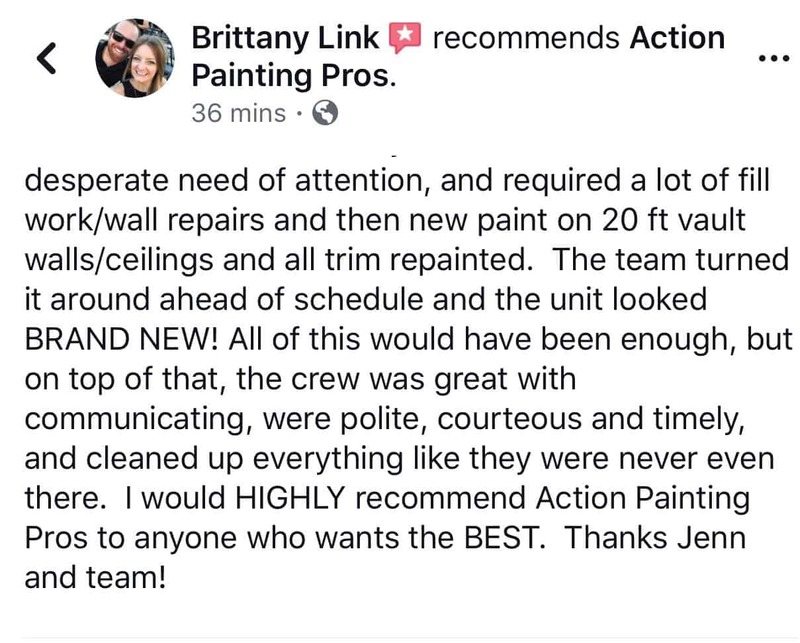 I have tried other painters/handymen, but I usually end up calling Jennifer and crew to fix the mess made. I have used them time and time again, and will continue to do so. Highly, highly recommend. I’ve moved into my house on January 2014, and have needed multiple painting jobs-big and small-since then. We had the entire house, including the garage (which was an unfinished garage that needed to be mudded, primed and painted…) painted. Juan Gomez and his crew were chosen by Jennifer for the job because of his drywall experience. Truthfully, the drywall job in my house was so bad I didn’t think it would ever look good, but I was wrong. I can honestly say that Juan and his crew did a beautiful job and I am a very satisfied customer. I would definitely use Action Painting Pros again. I am having the family over for Easter and I just wanted to thank you because everything looks great, inside and out!Can’t wait for them to see the difference paint makes.Let me know when you slow down at the end of the year or start of next year, I am going to do the Media room and my bedroom at some point.Thanks again, have a good Easter.